Mobile phones and simple text messaging may be the keys to victory in the world’s largest public health initiative: the eradication of polio. As the disease retreats from the global stage, thriving in only a few remote areas in three countries, it’s up to health workers to deliver vaccines and share information with speed and accuracy. Health workers in Pakistan are receiving cellphone and e-monitoring training at the Rotary Resource Center in Nowshera, Khyber Pakhtunkhwa. Rotary and its partners in the Global Polio Eradication Initiative are strengthening the lines of communication by giving cellphones to health workers in Pakistan and Nigeria, where a single text message could save a life. 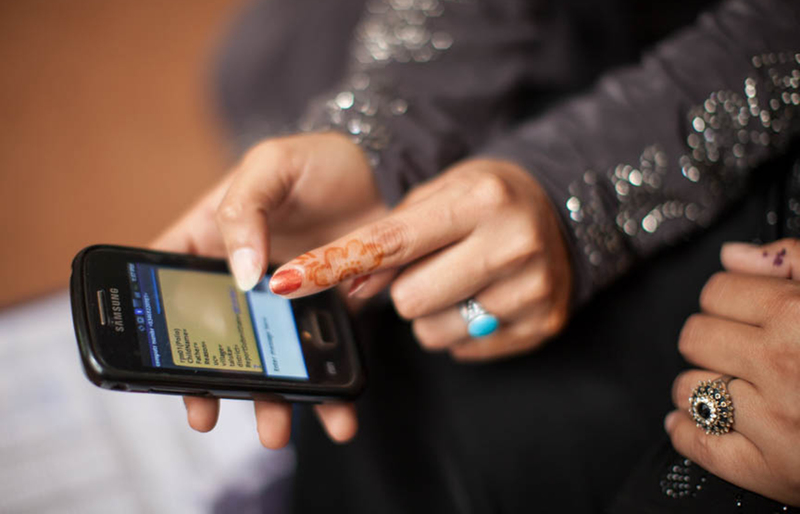 In Pakistan, Rotary has been working to replace traditional paper-based reporting of maternal and child health information, including polio immunization data, with mobile phone and e-monitoring technology. Community health workers across the nation have received more than 800 phones through a partnership with Rotary, the Pakistani government; Telenor, the country’s second-largest telecommunications provider; and Eycon, a data monitoring and evaluation specialist. Organizers plan to distribute a total of 5,000 cellphones by the end of 2018. Health workers can use the phones to send data via text message to a central server. If they see a potential polio case, they can immediately alert officials at Pakistan’s National Emergency Operations Center. They also can note any children who didn’t receive the vaccine or parental refusals – and record successful immunizations. In Pakistan, the polio eradication effort aims to reach the nation’s 35 million children under age five. The result is a collection of real-time information that officials can easily monitor and assess, says Michel Thieren, regional emergency director of the World Health Organization’s Health Emergency Program. Pakistan health workers are replacing traditional paper-reporting with accurate and timely cellphone-based reporting. “Cellphone technology signals tremendous progress in the polio eradication program,” says Thieren, who has directed polio-related initiatives for WHO in Pakistan. “The data we collect needs to have such a granular level of detail. With real-time information that can be recorded and transcribed immediately, you can increase accuracy and validity. “This gives governments and polio eradication leaders an advantage in the decisions we need to make operationally and tactically to eliminate polio,” Thieren says. Health workers also are using mobile phones to monitor a multitude of maternal and child health factors. Pakistan’s child mortality rate ranks among the highest in the world, according to UNICEF, with 81 deaths under age five per 1,000 live births. But mobile technology can help reduce those deaths, says Asher Ali, project manager for Rotary’s Pakistan PolioPlus Committee. They also can monitor infectious diseases, such as malaria, tuberculosis, and influenza-like illnesses, as well as child malnutrition and maternal health concerns. “If there is a problem with the baby or the mother, we can send information to the government health departments immediately, so they can solve the issue quickly and adjust their strategies,” Ali says. Cellphones also facilitate follow-up visits with families, because health workers can send appointment reminders over text message. Mobile phone use worldwide has spiked recently, with about 7 billion subscribers globally, 89 percent of them in developing countries, says WHO. Even people living on less than $1 a day often have access to phones and text messaging, according to WHO. Cellphones are used more than any other technology in the developing world. Rotary and other nonprofit organizations are leveraging this fact to boost a variety of health initiatives. The Grameen Foundation conducts a “mobile midwife” program that sends daily texts and weekly voice mails to expectant mothers, offering advice during pregnancy and the first year of the child’s life. UNICEF provides similar support to mothers, with a focus on nutrition throughout pregnancy and the first two years of a child’s life. Mobile phones also are helping in the fight against HIV/AIDS in Africa. The British nonprofit Absolute Return for Kids uses text messages to remind patients about medications and upcoming appointments. The Ugandan health ministry’s mTrac program, a mobile text messaging data collection network run in conjunction with UNICEF and other organizations, has a broader focus. Nearly 30,000 workers at 3,700 health centers submit weekly reports through their phones and receive surveys, alerts, and other communications. Questions go out to health workers about medical supply levels, conditions in clinics, and other critical issues. Members of the Rotaract Club of The Caduceus, India, collaborated with the Jana Swasthya Project in 2015 to screen more than 8,000 people for oral health conditions, hypertension, and diabetes during Kumbh Mela, one of the world’s largest Hindu festivals. The project established a digital disease-surveillance system to study epidemiological trends, replacing a paper-based data-tracking process and allowing officials to access live data with a few clicks. In 2016, after Nigeria saw its first polio cases in almost two years, Rotary and WHO officials rushed to replace traditional reporting with a cell-based system in the northern state of Borno, where the new cases were identified. The mobile phone initiative has since expanded to more than 11 states. The country has yet to see a polio case this year. Nigeria is also using cell-based mapping technology to identify areas that polio immunization teams have missed. Health workers test stool samples from children arriving from remote areas and log reports of acute flaccid paralysis. This effort started in Borno but has expanded to three additional states, Igomu says. After more than 1,000 people died earlier this year in Nigeria from meningitis, the country used the same digital tools in emergency vaccination campaigns, he adds.